After having many customers contact us to see if we could manufacture a silencer adaptor for their Walther M4 .22 LR and Walther HK 416 .22 LR rifles, we have decided to add this to our list of services. 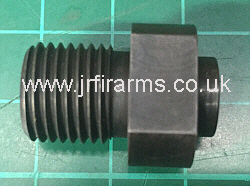 Our sound moderator thread adaptor can be supplied in either 1/2 x 20 UNF or 1/2 x 28 UNEF which will enable you to easily fit a sound moderator of your choice. 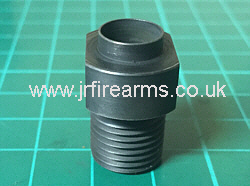 To install our barrel thread adaptor all you need to do is unscrew your standard muzzle brake and screw in the adaptor. We can also supply you with a thread protector if you should require one. Price for 1X adaptor £40.00 Discount given for larger orders. Registered firearms dealer RFD Bedfordshire, Buckinghamshire, Hertfordshire, Northamptonshire, Milton Keynes, Gunsmith services, gunsmithing, sound moderators.